Alesis Crimson Review – Is This Kit Worth Your Money? Is The Alesis Crimson Electronic Drum Set Worth Your Money? Read DrumPerium’s Alesis Crimson Review Below To Find out! Whenever someone thinks about buying an ‘Electronic Drum Set’ the first question that crosses their mind is, “Is it going to be expensive?”. After all, nobody wants to take out a second mortgage on their house just to buy a drum set. However, there is no denying that quality comes at a price and if you want a electronic drum set that produces super cool beats that gets everyone’s heads bobbing, you’ll need to fork out some serious cash. There are many cheaper brands on the market and these are marketed as ideal if you’re a beginner or intermediate player. The truth of the matter is that these cheap alternatives can’t even be considered worthy of mention. You’d be better off banging on a tin can with 2 chopsticks. The answer – Yes, there is one. It’s the new Alesis Crimson Mesh Kit and almost everyone is raving about it… and for good reason too. Alesis is a company based in Cumberland, Rhode Island. They specialize in producing audio mixers, drum machines, professional electronics percussion products and much more. They’re fantastic at what they do. For years they’ve been trying to create an ‘electronic drum set for beginner/ intermediate’ player that would be at a price point that is affordable for most people. Finally, they succeeded and it was worth the wait. 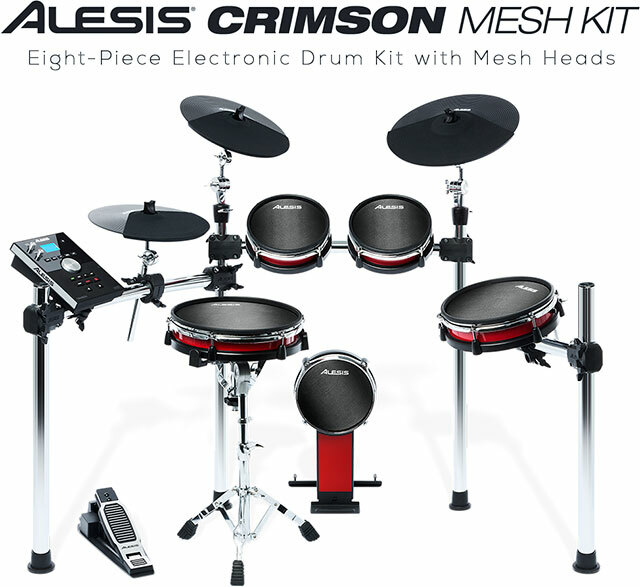 The Alesis Crimson Mesh Kit produces really high quality sound and is a mid-range unit. If you’re a drummer, you’ll love this set that is head and shoulders above its peers. 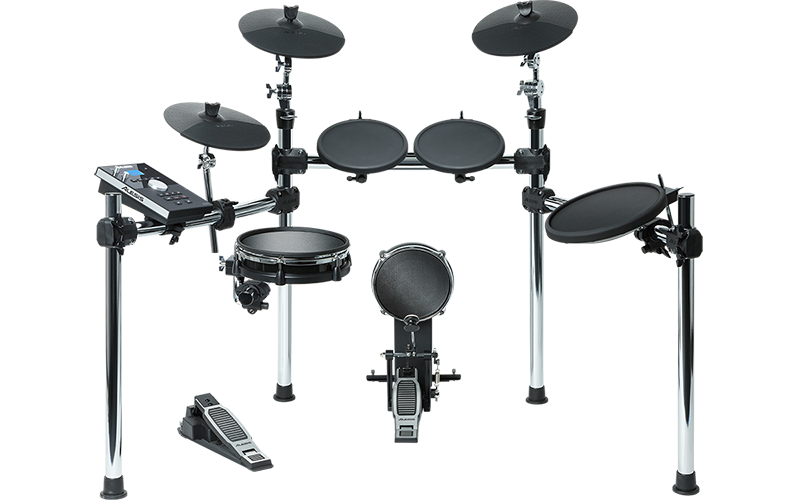 This is a standard 5-piece electronic drum set that comes in a cool all-black mesh. 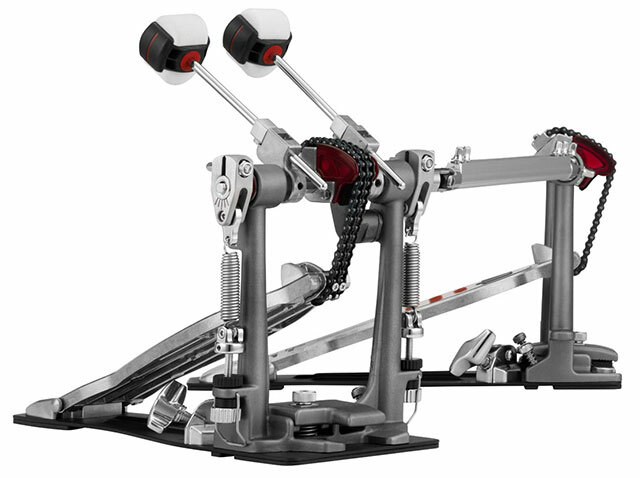 It can handle both a single and double pedal because the 8” Kick pad has ample space. Besides that, you’ll get a 10” dual zone floor tom and two 8” dual-zone rack toms. The Crimson has a 12” snare drum that is a favorite with most of the buyers. The set itself with the metal racks is sturdy, stable and durable. You won’t need to worry about the drum set wobbling during your furious drumming session. The three-zone 14” ride, 12” hi-hat with its own pedal and the 12” dual-zone crash that accompany this set will make even the beginners feel like a pro. Alesis claims that their module comes capable of producing 600 sounds. With the 20 extra ‘user kits’ and 50 preset kits, the number of sound permutations and combinations increases exponentially. The metronome will be very helpful for the beginner and you can even save the beats you play. You can always listen to your own music or proudly impress your friends and family with your drumming mixes. The Alesis Crimson has an internal memory that will allow you to save 4 or 5 tracks. You can use a USB memory stick that comes with the set to save another 99 tracks. What’s also interesting is that you can upload your own samples into the module and sync them to the trigger/pad that you’d like to use. This makes it fantastic for creating sound effects such as loops, etc. Other than that, the Crimson has a headphone jack, an auxiliary input (If you’re using iPods or other sound devices), mono and stereo outputs and a midi in an out. This set truly has everything you’d need. Does The Alesis Crimson Kit Play Well? Many people who have tried out the Alesis Crimson Mesh say that the snare on this model feels exactly like playing on a normal snare. The kick and toms are great too. The only thing we found slightly lacking was the cymbals. Since they’re made of rubber, it just doesn’t feel the same as banging on metal ones. But of course, this is just us being picky. The cymbals respond well and sound just like they should… we just wanted that ‘kick’ when playing on them. You can also choke the crash and adjust rim sensitivity, threshold, reduce the crosstalk between the head and rim, etc. There is a lot of flexibility here. You’ll need to start using the Crimson to experience just how versatile and accommodating it is. If you’re looking for an impressive drum kit, the Alesis Crimson Mesh Kit has your name written all over it. 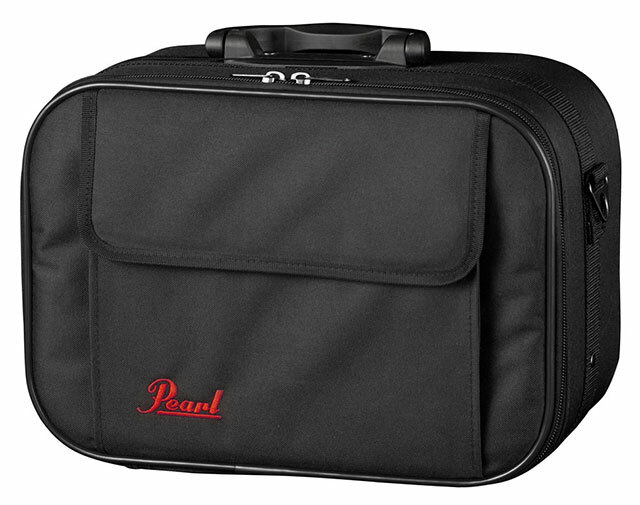 The quality and features that come with it are impressive and the beginner/intermediate player will seriously improve his or her drumming skills with it. Overall, the new Alesis Crimson Mesh Kit gets our highest recommendation. The kick pad and snare drum are absolute winners. The price is affordable and this electronic drum set is well worth the investment and will last you a long time. Do get it today. In Order To Write An Honest Alesis Command Kit Review. We need to start saying set-up was not perfectly easy. There was some difficulties just in how things were labeled, or rather not labeled, and the clarity of directions in general. Mainly just pictures which could be confusing for people that don’t have experience with setting up a drum set rack before. But if you have patience and a block of time to set aside for this task you can get through it. It arrives in one big heavy box and the unboxing seems like half the set up time. It will take a few hours at least if you are new at this kind of thing, so be prepared. Alesis Command Kit basically comes with what you see in the photo plus a pair of drumsticks. If this is your first electric drum kit, please notice that It does not come with headphones which are necessary for its use. Personally I think they (Alesis) could have easily tossed in some cheap ones. Both the 8″ Kick Pad and 10″ Dual-Zone Snare Pad have Mesh Heads. Mesh Heads gives a similar rebound and feel as an aucoustic drum head which is great. Also, When playing the kit for a while, the triggering of the Kick Pad seems to be lacking (despite lots of tuning). Especially when playing faster parts like blastbeats. That being said, if you aren’t going to play metal or faster stuff you should be ok. 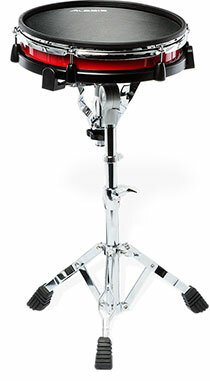 Furthermore, Alesis Command Kit includes two 9″ dual-zone rack toms and an 11″ dual-zone floor tom. All These three are rubber pads which takes some time to get used to, if your spoiled with all mesh like me. But unlike the Kick Pad, all three toms and the snare triggers and responds really well. The set also features a Ride Cymbal, Hi hat and a Crash (with choke) of which all comes in 10″ size. The playing surface (trigger area) is covered with a softer type of rubber which helps keep both bounce and noise down a little bit. The Alesis Command Kit Drum Module comes with 50 pre-programmed drum sets and over 600 sounds. You can import your own sounds via USB memory stick. In addition, There’s also a built-in metronome and 60 play-along tracks which makes practicing a lot more fun. Overall the mounts and rack, cymbals and pads are very sturdy and of professional quality. Alesis Command Kit includes an excellent mesh snare which is typically an upgrade on more expensive sets. It’s quite a good kit cosidering its price tag. 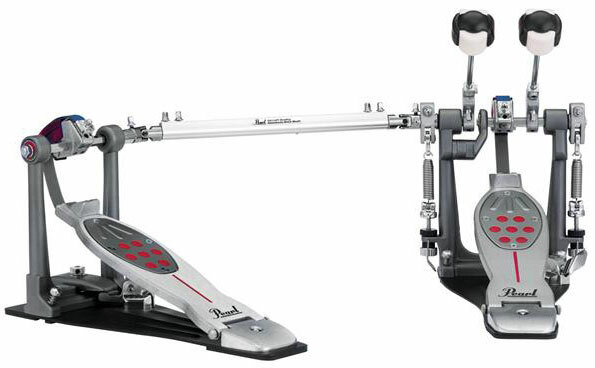 But, if you’re going to play real fast stuff, considering adding a double bassdrum pedal, Alesis Command Kit might not be for you. Alesis Command Kit Review – What’s In The Box ?